The Times reports that Jamal al-Harith, 50, was identified yesterday by his brother. 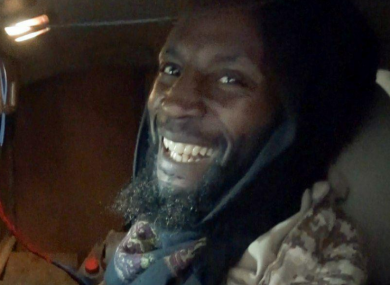 A SUICIDE BOMBER from the so-called Islamic State group was a British citizen detained at Guantanamo Bay who received compensation from the UK government, The Times newspaper has reported. The British fighter who IS claimed detonated a suicide bomb against Iraqi forces outside Mosul was named in British media as Jamal al-Harith, who was detained at the United States base between 2002 and 2004. An image released by IS and published on Monday by the SITE Intelligence Group was confirmed as al-Harith by his brother Leon Jameson. “It is him, I can tell by his smile. If it is true then I’ve lost a brother, so another family (member) gone,” Jameson told The Times. Channel 4 News cited an unnamed family member and another anonymous source as confirming Harith was pictured. The photograph shows him smiling, dressed in camouflage clothing and appearing to be sat in a vehicle with wires and switches in the background. The British government said it could not verify the reports. “The UK has advised for some time against all travel to Syria, and against all travel to large parts of Iraq. As all UK consular services are suspended in Syria and greatly limited in Iraq, it is extremely difficult to confirm the whereabouts and status of British nationals in these areas. Harith, a Muslim convert of Jamaican origin who was born Ronald Fiddler, was jailed in Afghanistan by the ruling Taliban because he held a British passport. After the regime was toppled he was arrested by US troops in early 2002 and sent to Guantanamo, where he alleged he experienced beatings and degrading treatment. On returning to Britain in 2004 he was briefly questioned by police and released without charge. The Times reports that he was among a dozen British citizens who alleged torture and UK complicity, prompting payouts from the government of about £20 million. Rita Katz, Director of SITE Intelligence Group, says Harith received compensation of £1 million. Harith travelled to Turkey and crossed into Syria in April 2014, the BBC reported citing Islamic State registration papers. The following year his wife, Shukee Begum, travelled to Syria along with her five children in what she said was an effort to convince her husband to abandon IS. After being reunited with Harith she was not allowed to leave IS territory and was smuggled out, she told Channel 4. Email “Islamic State suicide bomber was ex-Guantanamo Bay inmate who got £1m from UK taxpayers”. Feedback on “Islamic State suicide bomber was ex-Guantanamo Bay inmate who got £1m from UK taxpayers”.